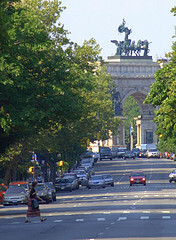 Park Slope Neighbors has initiated a campaign asking the New York City Department of Transportation to make Prospect Park West, 8th Avenue and Union Street safe for all users, by converting Prospect Park West and 8th Avenue to two-way streets, and putting Prospect Park West on a road diet. We’ve created a petition, addressed to NYC DOT Commissioner Janette Sadik-Khan, asking DOT to implement these changes in order to improve safety. This would actually be a "restoration" project, as 8th Avenue was changed from two-way travel to its current one-way northbound configuration on June 10th, 1930 by order of the NYPD – because they felt there was too much northbound traffic on 8th Avenue's one northbound lane. Rather than switching Prospect Park West to two-way travel (we believe it, too, was originally a two-way street, but have been unable to find conclusive evidence to that effect) to accommodate that traffic, they saddled Park Slope with nearly eight decades of bad road design, which is why we're asking DOT to "Reverse the Curse" and restore the original traffic pattern. Restoring two-way flow on Prospect Park West and 8th Avenue will have multiple benefits. First, two-way streets have been widely acknowledged to help reduce vehicle speeds, because of the "friction" effect of having counter-flowing traffic in the opposite lane (think 6th Avenue vs. 8th Avenue; the two avenues are the same width, but traffic on 6th Avenue is clearly calmer). Reducing vehicle speeds is the key element in improving safety: studies have shown that the likelihood of a pedestrian dying from being hit by a car traveling at 20 miles per hour is about 5%; at 30 mph, the likelihood of fatal injuries jumps to about 45%, and at 40 mph, the chance of death is about 85%. Streetsblog has compiled a significant amount of recent research that demonstrates quite conclusively that two-way streets are safer for pedestrians. Second, the conversion of Prospect Park West to north-south travel will likely alleviate a significant amount of the gridlock that occurs at the intersection of 8th Avenue and Union Street. By opening a second route to Grand Army Plaza from Park Slope and south, the 8th & Union intersection will no longer have to funnel all traffic headed to southbound Flatbush Avenue, Eastern Parkway and Vanderbilt Avenue. This should significantly ease the traffic back-ups down Union Street, helping to keep the intersection and crosswalks clear, to keep traffic moving more smoothly, and to reduce disruptive honking and unhealthy idling. Third, more two-way routes will make neighborhood access easier, reducing the distance that cars have to travel by reducing the number of turning movements. For instance, if someone wanted to drive from the corner of 2nd Street and 8th Avenue to the corner of 3rd Street and 8th Avenue, he or she would have to drive down 2nd Street to 7th Avenue, take 7th to 3rd Street, and drive up 3rd Street to 8th, rather than driving just one block on a two-way 8th Avenue from 2nd to 3rd Streets. 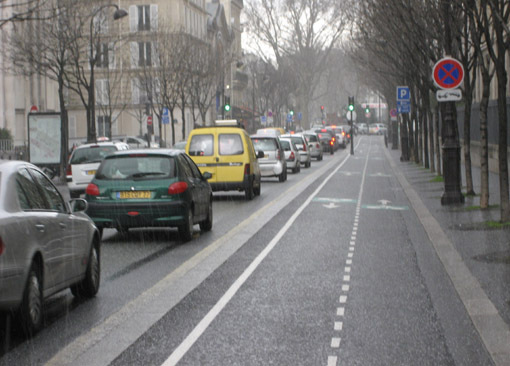 The additional driving necessitated by one-way streets creates more opportunities for vehicle-pedestrian and vehicle-bicycle conflicts, to say nothing of the negative environmental effects of all that extra driving. Because of the extra southbound capacity on Prospect Park West, our petition also asks DOT to install a Class I (physically separated) two-way bicycle lane along the park side of Prospect Park West, to be placed between the sidewalk and parked cars. That is the location in which north-south trolleys once ran along the park. The resulting configuration would still afford two northbound and two southbound travel lanes, one each on Prospect Park West and 8th Avenue, plus the north-south bike lane. We believe strongly that this reconfiguration of Prospect Park West and 8th Avenue will vastly improve safety for pedestrians and cyclists, as well as the circulation of motor-vehicle traffic, and we also believe that this is the best solution to the congestion problem plaguing the intersection of 8th Avenue and Union Street. Lastly, the petition asks DOT to implement additional traffic calming measures along Prospect Park West and 8th Avenue, including neck downs (which extend the physical curb at intersections to shorten and facilitate pedestrian crossings), leading pedestrian intervals at intersections (walk signals which turn green a few seconds before the traffic light turns green, allowing pedestrians to establish primacy in the crosswalks), and other "daylighting" measures designed to make pedestrians more visible to drivers. Add your name to our petition.